Most of us who work remotely do so because of the freedom it gives us from the traditional 9-5 office day. The freedoms you gain include the ability to decide when you work, how you work, and of course from where you work. Whether you are freelancing, working a full time position, or running your own enterprise, it is easy to get sucked into the glamour of living a ‘free’ life- waking up whenever you want, attending events regardless of what day of the week it is, going on trips without having to book days off weeks in advance… most would agree that it’s an ideal lifestyle. In reality, this lack of structure can lead to the same problems that remote working was meant to fix. It is easy to become unproductive and feel constantly guilty about what you have and have not achieved, blurring the distinction between work and free time. The good news is that the solution is easy to implement. Having regular routines worked for Benjamin Franklin (who minutely accounted for every hour), Joan Didon (who reviews her work before dinner every day) and Ernest Hemingway (who swore by writing at the peak of dawn each morning), and countless others. For the remote worker, routine helps you become more productive, reestablish work-life boundaries and make you happier and healthier. The benefits of having a healthy morning rituals are widely documented. Starting the day off on the right foot does wonders for productivity and wellbeing, but with nobody forcing you out of bed and into the office, it can be difficult to establish and maintain a good routine. The good news is that routines are self perpetuating, and once you start waking up at the same time every day, your body will naturally adjust. For remote workers, being awake and alert by the time you sit down in front of your tasks is of paramount importance. The emphasis now is on productivity, not time spent at the office, so your morning routine should be geared towards giving you maximum energy for your working day. Here’s a great thing about location independence- as long as you keep it regular, what time you wake up is up to you! Some people swear by 7am starts, and others won’t be mentally alert until 9 regardless of what their body does. Irrespective of when you wake up, it is a great idea to do some quick exercise soon after. Moving your body raises your energy levels, ensuring you are switched on for the day ahead. Anna Wintour is famously said to take tennis classes at 5 am, and while this may be a little extreme for the rest of us, a quick 15 minutes of exercise does wonders. If you meditate, afterwards is perfect for 10 minutes of calm and focus. Also remember that breakfast is important! Eat something that makes you feel good and gives you energy. You can look over to-do lists over breakfast and coffee, the perfect way to ease yourself into the working day. As a remote worker, you are completely free to choose your working environment. While this is a fantastic perk, choosing where to work from can every day can quickly become a source of decision fatigue. Different personalities and job roles have their requirements, and so while we can’t recommend any one location over another, we do recommend knowing your location in advance of the day itself. Actively choosing a default location, whether that is your home, a local cafe, or a co-working space, is one way to save yourself from decision making every morning. If you prefer more flexibility, the best thing is to set aside five minutes the evening before and look at your tasks for the next day. This can really help to inform your choice of location. Have a lot of calls to make? Better not head out to a cafe where background noise is out of your control. Perform certain tasks better when motivated by other people working around you? Co-working space it is. Creating a weekly plan works just as well too- that way you can plan your meetings, calls, and assignments around where you’ll be based. The key is to make these decisions when you are relaxed and have time to think them through, rather than on the morning itself. Waking up knowing what you are doing and where you are going makes a huge difference to your mindset and confidence that will boost your productivity immeasurably. 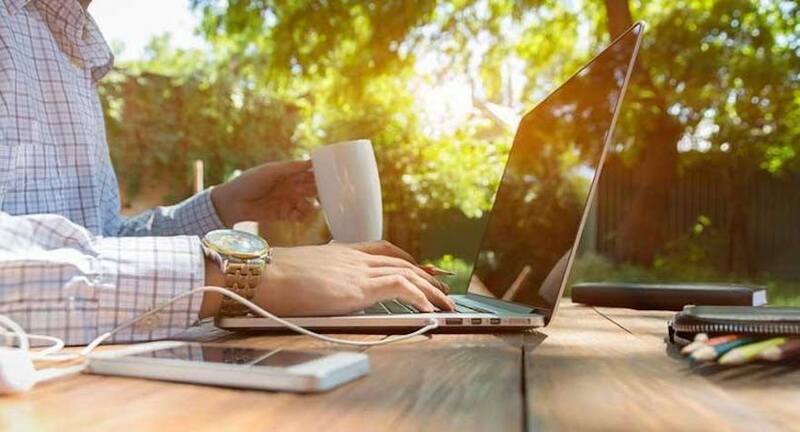 The desire to get things done and finish working as early as possible can make skipping out on lunch and other breaks very tempting for remote workers. If you’ve ever worked in an office, you are probably familiar with skipped lunches or lunches eaten at your desk. While your boss may be impressed, you know that it is detrimental to your productivity- working for more time doesn’t mean doing more work, and by the afternoon your brain switches off. If you are feeling overwhelmed or stressed, in the absence of colleagues to share things with, it can often help to take a walk to think things over- another great freedom of location independence. We all need breaks every now and again, and letting your mind relax enables you to come back feeling refreshed and inspired. It is now common knowledge that happy people are more productive at work, so remember that taking time for yourself does not mean that you are neglecting your job! While we mentioned exercise as part of your morning, it does not need to be limited to then, and is important enough for its own mention. We all know that exercise does wonders for our mind and body, and as a remote worker fully in control of your daily life, it is crucial to implement into your routine! There are many different ways to exercise regularly that you can experiment with. Using it as a way to wake up and prepare for the day sets you up fantastically, whilst exercise after a days work is a popular way to unwind and separate work from the rest of your evening. Going to the gym, taking classes, or joining a sports team is also a great way to meet new people for those who use their location independence to relocate, or those who miss the friendly banter between colleagues. As a remote worker, you are responsible both for setting your tasks and for completing them. It is easy to get these two roles mixed up, but separating them can save you a huge amount of mental energy and time. Take some time to plan every day so that once you start working you can focus on getting things done, not constantly deciding what to do next. Saving yourself from making these decisions allows you to develop a smooth workflow and eliminates the stress that comes from not knowing where you are in relation to your tasks. Knowing what you do best at certain times of the day is an easy place to start. Perhaps you are better at certain parts of your job in the morning when your mind is fresh, or maybe you leave admin for that mid-afternoon lull when it’s harder to be creative. When you are done with work, writing a to-do list for the next day enables you to know exactly where you stand and makes it much easier to get started the following day. Based on this, you can also decide where to work from, whether that’s a co-working space, a cafe, or your own living room. Different schedules work best for everyone and there are no hard and fast rules. Some people work best knowing what they will be doing for every minute of their day, and others keep their routines as flexible as possible. Part of the pleasure of working remotely is being able to try and test, discovering what works best for you and learning about yourself in the process! With that we wish you happy planning- we hope these tips help you rejuvenate your working day and would love to hear what worked for you, or any other ideas we haven’t mentioned in the comments below! Great tips! Thanks for sharing Kath… more power to you! Fantastic post! Just wrote a post like this my self with my own tips, but always cool to see what others do.